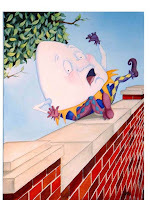 Humpty Dumpty Had a Great Fall, All Bernanke's Horses And All of Paulson's Men Couldn’t Put Humpty Together Again! Each time the government has come out with a new great idea for saving the financial markets, it has given it a new name with a new twist. In August 2007, when central banks injected hundreds of billions in new liquid funds into the banking system, and again, in March 2008, when the Federal Reserve rescued Bear Stearns, their goal was essentially the same as today’s: To boost investor confidence. Initially, they did. Among other things, investors bought more shares in insolvent banks, invested more in junk bonds of overrated corporations, and placed more bets on shaky derivatives. But that did not end the debt crisis. It only made it worse. The main reason: Even while authorities were dumping liquidity onto the markets from above, the fires on the ground continued to rage. More homeowners fell behind on mortgage payments. More credit cards, auto loans and student loans went bad. More bank balance sheets crumbled. Before long, investors realized they’d been duped. They fled in panic. And the debt crisis returned with a vengeance. Instead of restoring realism, the authorities created a fantasy. Rather than bringing stability, they fostered instability. Inadvertently, they helped create the very panic they sought to prevent. The same thing is going to happen again this time. Don’t let the enormity of their response fool you. The bigger it is, the more desperation it denotes. And the more desperate they become, the more likely their bailouts will fail. The government, despite all its power, cannot repeal the law of gravity to stop investors from selling. Nor can it turn back the clock to magically reverse the nation’s financial sins. Looking further into the future, there will be many reasons to expect a recovery. But first the economy will suffer a great fall. This article may be reproduced WITHOUT CHANGE and in its entirety for non-commercial and non-political purposes. This blog is not affiliated with www.christianobserver.org. In an article titled: A November Surprise? (Hope For The World Update) Gary Kah reveals some interesting facts about Barack Hussein Obama. On the other side of the aisle is a competitive and determined opponent who doesn't like to lose. Backing him are hundreds of ultra-liberal activists including many of Hollywood's biggest celebrities. Barack Obama owes much of his initial campaign success to Oprah Winfrey whose public endorsement and immense popularity catapulted him to political stardom. Without Oprah's concerted efforts and support, it is doubtful that Obama would have beaten Hillary Clinton for the Democratic nomination. Oprah's "new spirituality" meshes very well with Obama's religious views - tolerate everything except the "narrow" teachings of the Bible. Barack Obama is admittedly hard to resist. He has a certain likable quality which together with his smooth style and admirable communication skills can mesmerize audiences. But we must look beyond personality to his fruits. The fact remains: He is the number one most liberal politician in the US Senate, based on his voting record. Notice how many times Obama did not vote, or voted not present to avoid taking a stand on controversial issues. His positions on nearly every important issue put him squarely in the far-left/anti-biblical Christianity camp. His most vocal supporters are found among the MTV crowd. Just this week I saw one MTV "phenom" from Britain pleading with Americans to vote for Obama. Hopefully, if enough rock sensations from this crowd speak out for Obama, common-sense Americans will be so repulsed they will vote against Obama/Biden - if for no other reason. This is definitely turning into one of the oddest presidential elections we have ever witnessed. It is a bit frightening that the democrats so boldly and unashamedly are rolling out their socialist agenda and not even trying to disguise it (you mentioned a few years ago they would get bolder with their message). It is incredible that Obama openly decries that it is evil for people to be rich. I guess he has forgotten that we are, after all, a capitalistic society (at least for now anyway). I guess it's okay for him to live in a $2.2 million dollar house and earn $4 million dollars but not okay for everyone else. I always have trouble following the democrat's logic. After about a year, Ann's family moved to Mercer Island so that she could attend the island's new high school where she could eventually be on the debate team. According to Newswatch Magazine. Senator Obama's father, who was from Kenya, was also heavily linked to socialist activities. Sen. Obama identifies very closely with his Kenyan family roots. In August 2006 he made a special trip to Kenya to meet with a man named Raila Amolo Odinga. Odinga is the head of the National Muslim Leaders Movement (ODM) which is dedicated to overthrowing the legitimate democratic government of Kenya. Odinga is extremely anti-Christian, and it is widely believed that he would outlaw Christianity if he took power. Odinga refers to Barack Obama as a close, personal friend; although some Christian missionaries in Kenya allege that he is, in fact, Barack's cousin. Many Christians overseas are also becoming concerned over the prospects of an Obama presidency. This week our Israeli colleague, Barry Segal, emailed these news items about Obama's appeal to Muslims. Given the information we now have about Senator Obama and his family background, it is quite possible he would stand with the Muslims should the political winds "shift in an ugly direction." This is just the tip of the iceberg concerning Barack Hussein Obama. Much more disturbing information is surfacing about his closest contacts, chief supporters, and his voting record. Two former financial executives: Franklin Raines and Jim Johnson who were involved in the Fannie Mae accounting scandal are connected to the Obama campaign. Franklin Raines - was a Chairman and Chief Executive Officer at Fannie Mae. Raines was forced to retire from his position with Fannie Mae when auditing discovered severe irregularities in Fannie Mae's accounting activities. At the time of his departure The Wall Street Journal noted, "Raines, who long defended the company's accounting despite mounting evidence that it wasn't proper, issued a statement late Tuesday conceding that "mistakes were made" and saying he would assume responsibility as he had earlier promised. News reports indicate the company was under growing pressure from regulators to shake up its management in the wake of findings that the company's books ran afoul of generally accepted accounting principles for four years." Fannie Mae had to reduce its surplus by $9 billion. Raines left with a "golden parachute" valued at $240 million in benefits. The Government filed suit against Raines when the depth of the accounting scandal became clear. The Government noted, "The 101 charges reveal how the individuals improperly manipulated earnings to maximize their bonuses, while knowingly neglecting accounting systems and internal controls, misapplying over twenty accounting principles and misleading the regulator and the public. The notice explains how they submitted six years of misleading and inaccurate accounting statements and inaccurate capital reports that enabled them to grow Fannie Mae in an unsafe and unsound manner." These charges were made in 2006. The court ordered Raines to return $50 million dollars he received in bonuses based on the miss-stated Fannie Mae profits. Jim Johnson - A former executive at Lehman Brothers and who was later forced from his position as Fannie Mae CEO. A look at the Office of Federal Housing Enterprise Oversight's May 2006 report on mismanagement and corruption inside Fannie Mae, and you'll see some interesting things about Johnson. Investigators found that Fannie Mae had hidden a substantial amount of Johnson's 1998 compensation from the public, reporting that it was between $6 million and $7 million when it fact it was $21 million." Johnson is currently under investigation for taking illegal loans from Countrywide while serving as CEO of Fannie Mae. Johnson's Golden Parachute was estimated at $28 Million. Where are they now? Franklin Raines -- Obama's Chief Economic Campaign Advisor. Jim Johnson -- Obama's Senior Finance Advisor: ran Obama's Vice Presidential Search Committee. "...Ecclesiasticism without Christianity, the discipline of a monastic rule, not for God's sake or in order to achieve personal salvation but for the sake of the State and for the greater glory and power of the demagogue turned leader - this was the goal for which the systematic moving of the masses was to lead"(9) --Aldous Huxley. 1. Accuracy in Media newsletter, Donal Irvine, Chairman, Washington D.C., August 2008. 2. Newswatch Magazine, Sept. 2008, p.14. 5. Ibid. pp. 9, 19-22. 7. Accuracy in Media newsletter. 9. Aldous Huxley, Brave New World Revisited, (New York: Harper Collins, 1958) pp. 44-45. Also, read Barack Obama's two books, Dreams from My Father and The Audacity of Hope: Thoughts on Reclaiming the American Dream.